Violations of the federal Hatch Act? It has been 18 years and 111 days since the city’s pledge to build the West Branch Library. Many of us have heard of the federal Hatch Act. Broadly it prohibits local governmental employees from participating in local election activities. But since it’s a federal act who is covered and who is not? Please note that the Hatch Act specifically identifies firefighters and police officers. Why? Because their departments typically accept numerous federal grants. It is a fact that both Glendale and Phoenix fire departments have accepted federal grants for emergency preparedness. Therefore those department’s employees are covered by the Hatch Act. Both Glendale and Phoenix police departments have accepted federal grants for the hiring of additional police officers. Therefore those department’s employees are also covered by the Hatch Act. That brings us to a very interesting set of observations leading to questions. Phoenix Councilmember Danny Valenzuela is a city of Glendale firefighter and is a covered employee under the Hatch Act. Glendale firefighter Danny Valenzuela co-hosted a fundraiser for Glendale mayoral candidate Mark Burdick. Glendale Councilmember Sammy Chavira is a Phoenix firefighter and was also a co-host of the same event. Fact 1: The Hatch Act defines “covered employees” on the local level as those whose departments receive federal loans and grants and/or state agency loans or grants. Fact 2: Both fire departments of the city of Glendale and the city of Phoenix have received numerous federal loans and grants. Fact 3: Glendale firefighter Danny Valenzuela is a covered employee. Fact 4: Phoenix firefighter Sammy Chavira is a covered employee. Fact 5: Danny Valenzuela co-hosted a political fundraiser for Glendale mayoral candidate Mark Burdick. Fact 6: Sammy Chavira co-hosted a political fundraiser for Glendale mayoral candidate Mark Burdick. Therefore it is alleged that Valenzuela and Chavira are in violation of the Hatch Act. It is the responsibility of the Glendale City Attorney and the Phoenix City Attorney to investigate and to corroborate these facts for the purpose of recommending disciplinary action. That action can range from a fine to termination of employment. Neither of these men can hide behind the cover of their elected office as councilmembers. Their primary jobs have been as firefighters for many, many years long before they were elected to political office. Their elected positions are secondary occupations. Hopefully the voters will come to realize what an untenable position these men hold. If they want to be politicians, fine, but they should quit or retire as active city employees. It is now up to the Glendale and Phoenix city attorneys to issue opinions regarding these alleged violations of the Hatch Act. Let us hope they do not whitewash these allegations in favor of their political bosses for councilmembers hire and fire City Attorneys. It is one of several positions, such as the City Manager, that are the direct hires of a city council. If these firefighters, covered employees, are found to be allowed to participate in local elections, it sets precedent for all city employees covered by the Hatch Act. As for Sammy, it’s just another lapse in a long line of questionable ethical decisions he has made. Add it to the $25,000 of taxpayer money he spent on “fun” trips; the council meetings he has missed; and his lack of outreach to the people of the district he is supposed to represent. It appears that both of these men are in violation of the Hatch Act but then again, I’m not a city attorney and certainly not well versed in the art of spinning a situation to make it go away for my boss. Whatever the determination it deserves a public announcement. This photo was sent to me within the hour by one of my blog readers. Take a good look. This afternoon these two gentlemen were seen putting up campaign signs and there are more in the bed of the truck. Do you see the logo on the truck? It is a Hope for Hunger truck. Hope for Hunger is a 501c3 non-profit corporation. It was started by and is run by Randy Rodriquez, a Glendale fire fighter. Make no mistake. It does good work in the community. It distributes food to thousands of people annually. It fills an extraordinary need. So, what’s the problem? “Nonprofit corporations with a 501(c)(3) tax exemption cannot participate in or contribute money to political campaigns. If they do, the IRS can revoke their nonprofit status, and can assess a special excise tax against the organization and its managers.” (http://definitions.uslegal.com/n/non-profit-corporation/) In addition they cannot endorse candidates. 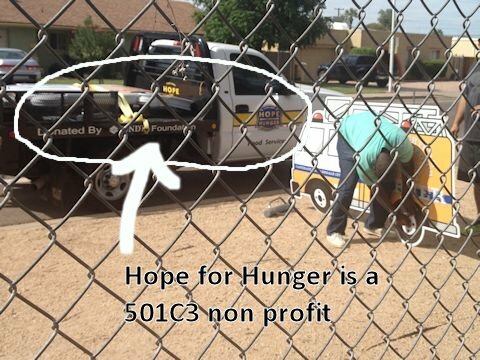 Let’s for a minute assume the two gentlemen putting up a fire endorsement sign for Barrel district candidate Bart Turner are in no way connected to the 501c3 nonprofit, Hope for Hunger. There still remains the issue of the use of a nonprofit’s equipment, in this case a truck, for a political campaign. It, instead of money, is an in-kind contribution. You can barely see but there are more campaign signs in the bed of the truck. For years the Glendale fire union has been a major influence in political elections in Glendale. This time, someone may have crossed the line by using a nonprofit’s equipment for political purposes. That’s what’s wrong with this picture.